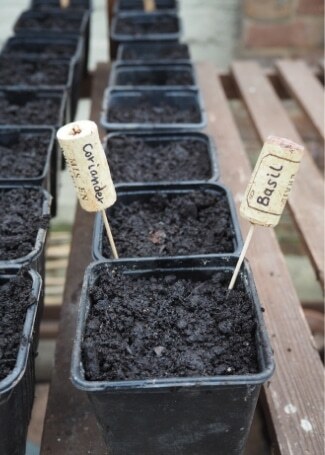 With a busy spring sowing in the greenhouse and garden, once you’ve decided what you want to plant, it’s important to keep track of what you have planted where. 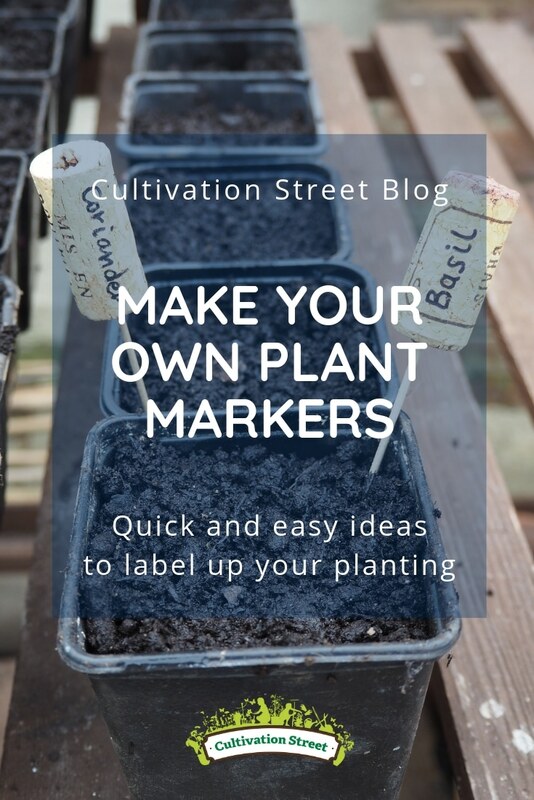 While there are plenty of great plant labels available to buy, a fun way to keep yourself organised and reduce your plastic use is to make your own. which involve little or minimal cost and are easy to make at home. If you have sown a number of seeds or are running a school or community competition, like growing sunflowers, it’s important to know whose plants are whose. A nice alternative to plastic labels, which aren’t good for the environment, is to use wooden lolly sticks as these are far more environmentally friendly. You can pick these up cheaply in your local craft store or they can be saved from your household waste after a lolly enjoyed on a hot summer’s day. For labelling, it’s an idea to write in pencil first so they can be rubbed out and renamed if need be. Store them safely away once you’re done and they can be reused later down the line. When you’re preparing a flower bed for planting, chances are there will be some stones you want to remove or sift out. Keep an eye out for decent sized stones and put the ones you’ve unearthed to one side. When you have a good collection, give them a good old clean. Once they are dry, you can add your own creative design – let your imagination run wild. You can buy paint pens that are designed to be able to use on rocks and other similar surfaces, plus they don’t require the use of paint brushes – or the endeavours of cleaning them afterwards. An easy way to start is with a white gel pen, simply writing the name of the seeds you have sown and adding some decoration. If you really want to go to town, you can use a range of colours of acrylic paint or paint marker pens to create beautiful designs. You could even incorporate a picture of what you’re growing. The kids will love getting involved with this stage, so why not let them decide the design and then paint it together. It’s important to seal your gorgeous designs to keep them weatherproof and make sure they last from one year to the next. Some paints or marker pens are self-sealing so check before you buy whether they describe themselves as safe for outdoor use. If you’re not sure though, it’s always best to use a spray sealer. 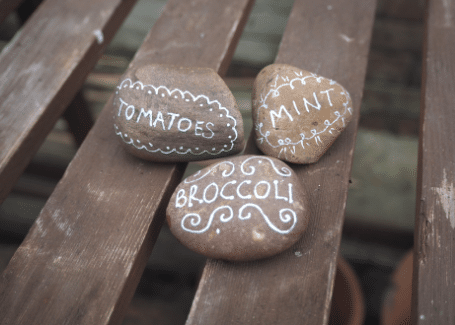 These are more effective than using a paint on sealant as these can smudge your crafty creations. Another quick and easy idea is to reuse your bottle corks. These can be labelled up with a biro which should be weatherproof. Cork is a really durable material and bottle corks will have been treated to stop leakage, so they’ll last the test of time. Simply push a cocktail or kebab stick into the base and then pop this directly into the soil. They’re perfectly compact and another effective label for your freshly sown seed trays, for example if you want to know which different tomato varieties you have planted for your tomato soup. Another simple way to label up your pots is to reuse some of your excess clothes pegs – the wooden ones work best. 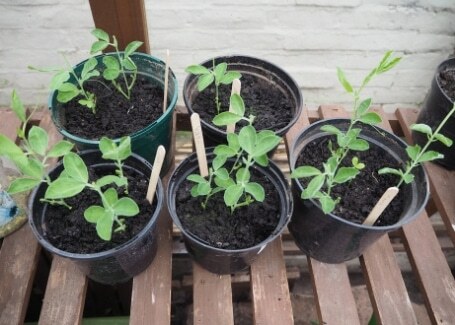 As with the lolly sticks, if you write in pencil you can change your labels to suit what you sow each year. For a permanent label you could write in biro or have fun using an embossing label maker as these are long lasting and really clear to read. Decorate or colour code your peg for what your growing. A pink peg could represent veg, green for herbs and blue for fruit. What’s great about using pegs is that you can clip them to anything. As the plant grows upwards, pop a kebab stick into the ground next to it and slide the peg higher every week so it doesn’t get lost in the green growth. 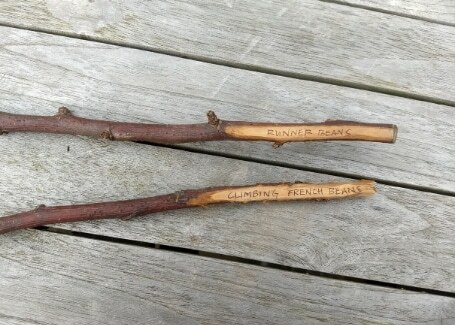 When you’re tidying your garden, pruning any trees or shrubs, save a few of the sturdier twigs to use as labels for your plants. Carefully shave one end with a garden knife, a kitchen peeler works well too. 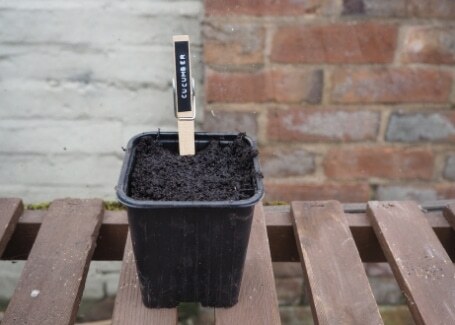 This creates a flat surface to write on and, in turn, another free and extremely easy and effective plant label. This style of homemade plant label will lend itself really well to rustic and cottage gardens, leaving the green foliage in the flower beds uninterrupted by manmade objects. These home-made plant labels will keep costs down and give you an excuse to get crafty with the kids but they’re also completely plastic-free – so it’s win-win! Check out this blog for more wildlife-friendly gardening tasks and tips to get your garden growth coming up roses. Have you tried any of our ideas out? Do you have any other creative ideas of how to label your plants? We’d love to see what you’ve been up to. Do remember to tag us in on social media whenever you post and we’ll share as much of your great ideas as we can (@CultivationStreet on Facebook and Instagram, @cultivationst on Twitter).